© n.d. University of California, Berkeley. Three Class 8 trucks equipped with CACC during field test. The Federal Highway Administration (FHWA) estimates that freight tonnage moving on the Nation’s transportation network will grow 40 percent in the next 25 years and the value of the freight will double.1 FHWA’s Exploratory Advanced Research (EAR) Program is pursuing research that will help alleviate the looming problem posed by increasing demand for highway freight capacity by allowing long-distance trucks to travel together more efficiently. The research projects titled “Partial Automation for Truck Platooning,” and “Cooperative Adaptive Cruise Control” are underway at Auburn University (in partnership with Peterbilt Truck, American Transportation Institute, Peloton Technology, and Meritor, Inc.) and at the University of California, Berkeley’s Partners for Advanced Transportation Technology program (in partnership with Volvo Technologies of America and Cambridge Systematics). These projects are developing technology and strategies that allow two and three trucks to travel close together in “platoons,” using advanced sensors and connected vehicle technologies to maximize efficiencies. The EAR Program’s research into truck platooning is informed by stark economic realities of long-distance freight movement. Over the past decade, fuel costs have been the largest single component of a trucking fleet’s costs per mile (CPM). Even at record-low 2015 prices, fuel costs that year were slightly higher than $0.40/mi, second only to driver wages.2 Small improvements in efficiency can have a significant payoff, and technology that allows trucks to communicate and travel together efficiently in multivehicle platoons promises to help lower fleet CPM. Many current-generation Class 8 trucks—the tractor-trailers typically used in freight transportation—are equipped with adaptive cruise control, which automatically adjusts truck speed to maintain a safe distance from vehicles ahead. The EAR Program seeks to combine single-vehicle adaptive cruise control with additional onboard sensors and vehicle-to-vehicle communication to exchange information between the trucks and automatically adjust engine and brakes in real time as conditions vary. This system, known as cooperative adaptive cruise control (CACC), incorporates onboard vehicle sensors—including radar, global positioning system (GPS) applications, and video cameras—and data exchange operating within a dedicated short-range communication (DSRC) system. The CACC system exchanges operational information between the trucks at 10 Hz and can automatically adjust engine and brakes to maintain longitudinal control (speed and separation distance) as conditions vary. Drivers are responsible for lateral control (steering and lane-keeping) and monitoring roadway and traffic conditions. The system makes it possible for the CACC-equipped trucks to travel closer together with more precise control than manual operations alone, thus allowing for potential fuel savings. Platooning research by the Auburn research team focuses on business case analysis, vehicle aerodynamics analysis, and traffic modeling of partially automated two-truck platoons in which between-truck distance is controlled by CACC. The Auburn research team’s on-road investigation of fuel economy in two-truck platoons showed a peak combined fuel savings of nearly 7 percent (roughly 5 percent for the leading truck and up to 10 percent for the trailing truck) at separation of 30 ft. The trailing truck showed a maximum fuel saving of more than 10 percent at a following distance of 50 ft (a more realistic following distance, based on surveys that assessed driver comfort). Fuel saving efficiencies will require an initial investment associated with equipping trucks with CACC technology. Auburn researchers found that private fleets and large over-the-roadline haul fleets are in the best position to be early adopters. Fleets and drivers who operate average truck trips of more than 500 mi would experience the highest returns on investment from platooning. From the perspective of managing public investment in highways, platooning could improve overall highway traffic flows, once truck market penetration reached 60 percent along specific routes. Photo credit: © n.d. Auburn University, College of Engineering. 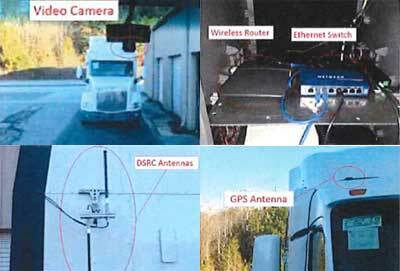 CACC system incorporates video cameras, a dedicated short-range communication system for inter-vehicle data exchange, and GPS. 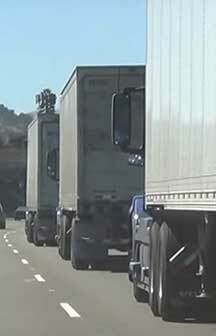 The UC Berkeley research team is testing CACC using three-truck platoons in real highway traffic. The lead truck operates either under a driver’s full manual control or under partially automated adaptive cruise control. The following trucks are under full CACC control that couples the trucks in a synchronous string, using signals transmitted over a DSRC system operating at 5.9 GHz. Unlike previous platooning systems that relied on a “constant distance gap” strategy, the CACC approach employs a “constant time gap” strategy in which the separation distance is proportional to actual speed. The system makes it possible to have a near-zero response time for controlled longitudinal parameters and permits the leading truck to remain “visible” at all times to the third truck, even though the actual line of site is blocked. The road trial also is assessing how CACC responds to real traffic conditions, such as when another vehicle changes lanes and breaks the string. The research team designed the control system to designate a new lead vehicle automatically in such cases and establish a new following gap and strategy. For more information about the Auburn University projects, contact Kevin Dopart, 202-366-5004 (email: kevin.dopart@dot.gov); or for more information about the University of California Berkeley project, contact Osman Altan, 202-493-3391 (email: osman.altan@dot.gov). The EAR Program addresses the need for longer term, higher risk research with the potential for long-term improvements to transportation systems—improvements in planning, building, renewing, and operating safe, congestion-free, and environmentally sound transportation facilities. The EAR Program seeks to leverage advances in science and engineering that could lead to breakthroughs for critical, current, and emerging issues in highway transportation—where there is a community of experts from different disciplines who likely have the talent and interest in researching solutions and who likely would not do so without EAR Program funding. 1 U.S. Department of Transportation, Bureau of Transportation Statistics and Federal Highway Administration. (2016). “Freight Analysis Framework, version 4.1.” Washington, DC. Available online: https://www.rita.dot.gov/bts/press_releases/bts013_16, last accessed May 11, 2017. 2 Torrey, W.F. and Murray, D. (2016). An Analysis of the Operational Costs of Trucking: A 2016 Update. American Transportation Research Institute. Arlington, VA.